On September 14, 2016, the Zionist-controlled York University in Toronto, Canada fired Nikolaos Balaskas, a long-time laboratory technologist in its science faculty for blaming Jewish Bolsheviks for murdering 7-10 million Russian Christians. Genrikh Grigoryevich Yagoda, born Yenokh Gershevich Iyeguda was a Soviet-Russian secret police official who served as director of the Soviet genocidal police NKVD, under Soviet dictator Joseph Stalin, from 1934 to 1936. It was Stalin who established the first Jewish state in Soviet Russia in 1934. Harvard historian professor Niall Ferguson in his highly praised 2006 book, The War of the World, claimed that some of the greatest mass murderers of modern times were Jewish. Ferguson’s research, however, centered on the Bolshevik revolution and the Lenin and Stalin era during which Jewish elites in the Russian government and Bolshevik terrorist organs like Cheka, GPU, NKVD and KGB, sent over 100 million Christian and Muslim communities to death camps or rooted out of their native homelands. On August 22, 2016, a complaint against Nikolaos Balaskas was lodged with the university administration by Amanda Hozebagg, national director of B’nai B’rith Canada. 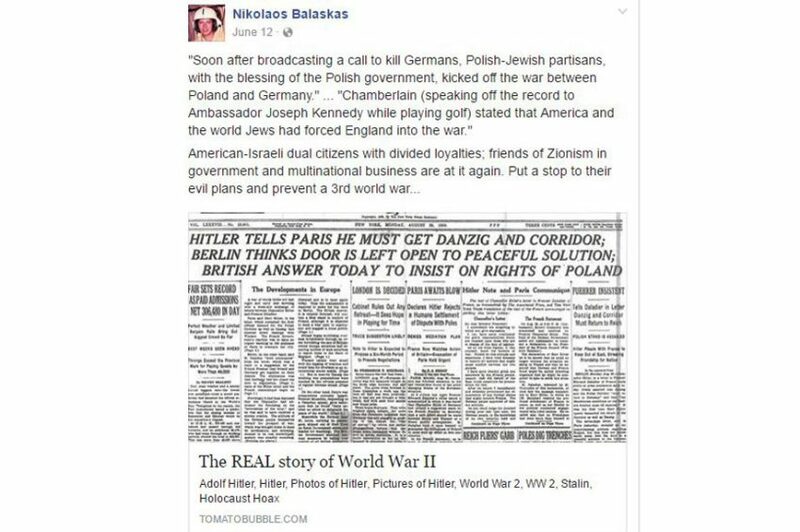 It accused Balaskas of posting political wrong statements on his Facebook page such as denying the Jewish Holocaust, describing a Nazi war criminal as a hero, Zionists being servants of the Evil One seeking to bring a new Holocaust upon the world, and Jews behind WWII, and 9/11″. After the university’s decision to fire Balaskas, Hozebagg issued the following statement. In February 2016, UK’s opposition Labour Party leader Jeremy Corbyn’s son Tommy Corbyn, a student at Toronto’s York University was accused of attending the Israel Apartheid Week at the York University by the B’nai B’rith.